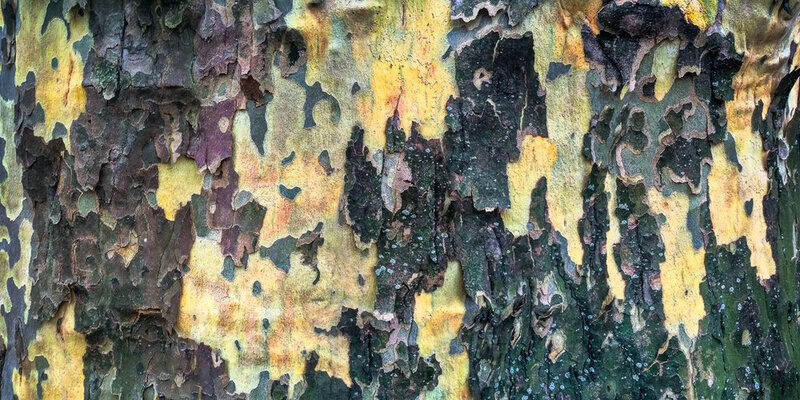 One day when walking through Central Park in New York I came upon the London Plane tree above. I had been experimenting with composite images to build larger images, but was mostly working with wide panoramic views. When I saw this tree I had the thought that maybe something similar could be done with a tree trunk. So I worked my way around half of this tree and took a half-dozen overlapping images. When I looked at the "slices" on my computer screen I began to get excited. After a few hours of work repositioning and masking the image slices the image above was the result. And, the original captures were all done with an early iPhone! Surrounds like these allow us to see everyday trees in a way that is otherwise impossible. We can look from one angle or walk around to see others, but by painting together a dozen or more images we can see the character of all (or most) of a tree's trunk at once. The image titles will tell you how many degrees the image comprises. And if you look closely, you will see an element of the image that repeats near the edges, thus 370°. The images below are large thumbnails. The best way to see the full surrounds is to set your browser to Full Screen mode and then click on the thumbnails.